The tag 'folly' is commonly ascribed to wacky architecture ... subsequently judged 'not fit for purpose'. Which must be a tad galling if you were part of the team which built it! Seeing a new motorcycle through production - and into the showrooms - is not without trials and tribulations, either. Take the Hesketh V1000, for example. Was all the effort involved in its design and manufacture worth it, at the end of the day? Not from a financial point of view, certainly. Few of them were built and sold! Might, then, the Hesketh V1000 be judged a mechanical folly? Probably! But, then, a true folly stands proud - proclaiming itself a glorious failure. Perhaps, the Hesketh V1000 should do the same! It was not as if the losses would have hit Lord Hesketh that hard. He was, after all, in a position to fund the F1 team which bore his name. The noble lord's goal with the V1000 was nothing less than to resurrect the British motorcycle industry ... well, his part in it, anyway! And, he could have succeeded. The Hesketh was not a bad bike ... for the most part! It was stylish, for starters. So far so good! When it came to the cycle parts, everything was tickety-boo, too. The frame was made from nickel-plated steel tubing, do not you know? Suspension was by Marzocchi. And Brembo supplied the disc brakes. As you would expect, then, the V1000 handled and stopped to perfection! Why, then, did a bike so steeped in quality fail? Did it, perhaps, have an Achilles' heel? Lord Hesketh's choice of engine designer could not be faulted. Weslake were at the top of their game. What they did not know about four-stroke motors was not worth knowing. But somehow, something went awry. The V-twin which left the Weslake workshop was noisy, and prone to leak oil ... not good! The gearbox was basic, at best. Notwithstanding, the twin cams and four valves per cylinder still belted out 86bhp - and did so smoothly enough. Top speed was 120mph ... pretty quick, at the time. So, things certainly were not all bad! Sadly, though, there were enough 'rotten apples' to sully the bike as a whole ... at least, in buyers' minds. 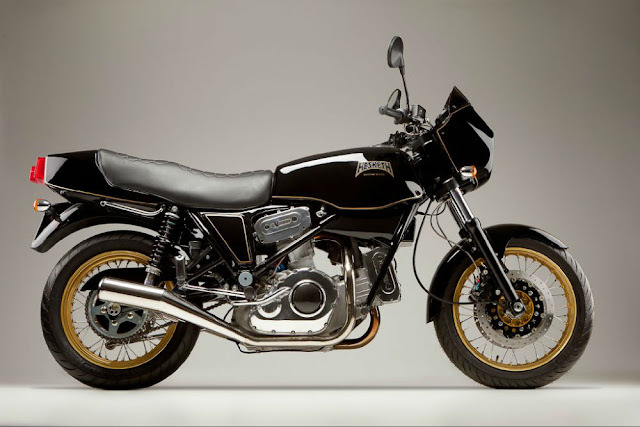 Which was a shame - because Lord Hesketh's vision for the V1000 should have led to a good British motorcycle. In true folly fashion, though, it finished up a mere 'whimsy' - which had promised so much, but delivered so little. Anyway, hats off to his Lordship for trying!